Yesterday was my birthday – I turned 32. I was woken up by my 7-month-old around 6 am; I nursed him and then he went back to sleep. Around 6:45 my 3-year-old daughter came in the room, and said, “Mommy! It’s your birthday! Daddy said I could sing the Happy Birthday song to you today!” Then she burst into song. My birthday is on Veteran’s Day, so there was no preschool. I decided to find a new place to take the kids, so we visited Old School. When I was getting Baby Paul out of the car, I discovered he had a poopy diaper. So I changed him on the front seat, trying to do it quickly because it was a very cold and rainy morning. In the process, he peed all over his onesie and coat. I found him a new outfit, but not a new coat, so he was stuck wearing the pee coat. Marie then told me she needed to go potty, even though she had just went before we left the house. She has a fascination with trying the potty in new places. After using the potty in the 5th Street Market, we crossed to the 5th & Pearl building and took the 5 foot elevator ride to the first floor, and ventured down the hall to Old School. Maybe it was just the mini elevator ride (remember Being John Malkovich? ), but I felt like I’d arrived in a magical place when I stepped into Old School. It’s just a space where kids can play and work on crafts, but something about the ambiance is very special. We arrived a few minutes before 11, an hour past my original goal, but just in time for story time. We listened to stories, made a birdfeeder, and then Marie just played dress-up for about an hour before I decided it was time to leave. When we left, Marie told me she needed to use the potty again. We went into a new restroom (so fun!) and she laid down on the floor of the stall to look at the mom and child in the next door stall. Meanwhile, I was holding baby Paul in the Ergo carrier. “Get up Marie! You’re being rude!” I told her. “But I’m tired,” she said. I had to pick her up off the floor and set her on the potty, while holding the baby. Then of course I had to pick her up again when it was time to wash hands. 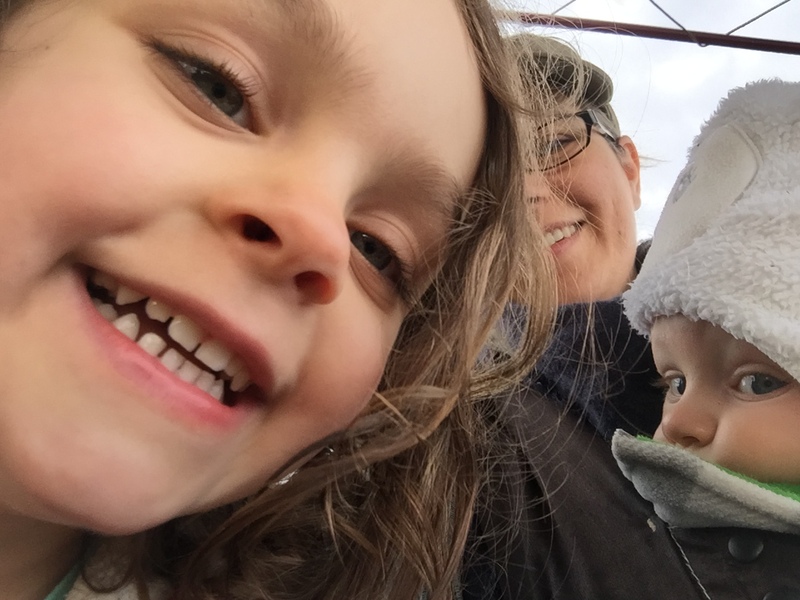 All this to say – it’s a major ordeal to go anywhere with a 3-year-old and a baby. Additionally, I was recovering from a bladder infection that I’d been trying to fend off naturally without antibiotics. So my mom got off work early to come help me out with the kids. When she got to our apartment, I tried to get some chores done, but I got dizzy and had to lie down. She took Marie to her house so I could rest, and I was able to nap with the baby for awhile. By the time Spencer got home from work, I decided that he should take me to the after-hours clinic. I was imagining my UTI spreading to my kidneys and of course, leading to my imminent death. So instead of a date night, we got to visit the doctor. And the good news was that we found out my UTI was gone. At that point I think I was just feeling sick from fighting off the virus that Marie turned out to have later that evening! She woke up around 11 pm with a nasty cough and a fever. Ah. So it was a hectic day. Additionally we found out my husband’s grandma had a heart attack that morning, induced by a panic attack. And I was thinking of my friend who is battling Stage 3 breast cancer — at age 30 — and had a bilateral mastectomy scheduled the next day (today). But I still came out of the day feeling loved and appreciated. Spencer gave me a really thoughtful gift, as he tends to do. He got me books by two of my favorite writers, T.S. Eliot and Gregory Maguire. I’d even forgotten that I love Gregory Maguire, and I didn’t know he has a new book out, about Alice in Wonderland. So by remembering that I love a writer that I didn’t even remember I love (does that make sense?) Spencer pretty much proved that he is a good best friend/husband. And I had the opportunity to hear from quite a few people throughout the day via phone and Facebook. My college friends Jay and Holly called me for a surprise FaceTime chat while Spencer and I were watching our current Netflix favorite, Jane the Virgin. And my two best friends from high school texted me to wish me a happy birthday. So it was fun to think about all the people who are an important part of my life now, or who have been important in the past. I’m thankful to have had a lot of special people in my life during the past 32 years. I’m thankful that my husband has been my best friend for the past 12 years, and that he’s been there for me in many ways – like taking me to the ER in the middle of the night when my son was 1-week-old and I had endometritis, planning a surprise ice skating birthday party for my 23rd birthday, bringing me takeout from Pine State Biscuits after I had a miscarriage, and celebrating our 5th wedding anniversary with a trip to Kauai. I’m thankful that we are able to live near my parents who offer me constant support – my mom is in our kitchen washing my dishes right now. And I’m thankful to be sharing my life now with two precious little ones – my daughter, the feisty future Broadway performer, and my sweet happy baby boy. It really is a wonderful life. I tried to take this selfie a few weeks ago, but my daughter hijacked it.